Danish export credit agency (ECA) EKF has frozen all new guarantees to Turkey, as concerns about the country’s economic health continue to mount. The Turkish lira has lost more than 45% of its value this year and continued its plunge this week amid a growing geopolitical storm between Turkey and the US. There are widespread fears that other emerging markets will get dragged into the crisis, including South and Southeast Asian nations and parts of Latin America. Commercial lenders across Europe are watching the situation closely, especially those with high levels of exposure to the Turkish economy. “There are some European banks that are exposed to Turkey – BBVA, UniCredit, BNP Paribas – but these are strong, very large banks that may see a negative impact on their profits from their Turkish operating areas, but won’t face fundamental problems,” IHS Markit’s principal economist Andrew Birch tells GTR. Despite this, BBVA shares plunged 5.7% last Friday, BNP Paribas fell 4.4%, with UniCredit stock losing 6.4%. Turkey accounted for 14% of BBVA’s total profit in the first half of the year, Reuters reports. Development banks such as the European Bank for Reconstruction and Development (EBRD) and the European Investment Bank (EIB) are also lenders who have large exposure to Turkey, and both of these could face problems with their outstanding loans in the country, Birch says. Turkey is one of EKF’s largest markets and the ECA regularly funds projects there that use Danish exports. It has financed more than 15 wind projects in Turkey over the past 10 years, including the US$100mn Balabanli windfarm last year, co-funded with UniCredit. Lynge Gørtz Smestad, senior analyst at EKF, tells GTR that the agency is “not that concerned” about that existing debt because “we mainly have bank risk on our books”. “Our assessment is that in the long run, the Turkish financial sector is pretty healthy. It’s well-capitalised and regulated. So I think our counterparties in Turkey are among the best, but of course we’re aware of the situation because it is a big market for EKF,” he says. Should there be a rate hike or other government intervention to stabilise the lira, EKF may reassess the freeze, but Smestad says that EKF and “all the banks around the world” will be watching the situation carefully. There are huge concerns about Turkey’s domestic banking sector too. The likely loss of foreign investment inflows is likely to undermine its banks’ trade, project and export finance businesses. “In the first quarter of 2018, Turkish banks had outstanding foreign liabilities equivalent to 23% of total funding, or 230% of official foreign exchange reserves,” Birch says. Turkish banks regularly tap international debt markets as a means of funding their trade lending. Indeed, annual refinancings of Turkish bank debt are viewed as calendar events and attract lenders from around the world. In March, for instance, Akbank refinanced US$1.2bn-worth of debt with 39 banks from around the world. “Despite the domestic volatility, the facilities achieved a strong global response with the participation of 38 international banks across North America, Western Europe, Asia and the Middle East which is a testament to Akbank’s strong fundamentals and successes through volatile markets, as well as the resilience of the Turkish financial sector,” reads a bank statement accompanying the refinancing announcement. In May, meanwhile, Yapi Kredi refinanced US$1.5bn-worth of debt, with 48 banks from 19 countries joining the syndicate, and eight new lenders this year. 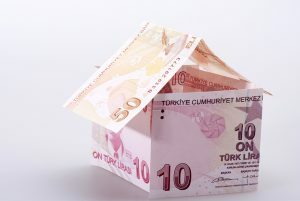 It’s been reported that some domestic banks are selling their project finance loans to lenders from the US and China in a bid to free up their balance sheet for domestic lending, on the request of the Turkish government. For now, the unrest in the Turkish economy shows no sign of abating. Today (August 15) the Turkish government announced that it was raising tariffs on US imports including cars (120%), alcohol (140%) and tobacco (60%). Turkish President Recep Tayyip Erdogan has encouraged Turkish people to boycott US electrical goods, including iPhones, and to replace them with Turkish-made products. He has accused US President Donald Trump of “economic warfare” over the US’ punitive tariffs on Turkish metals. Trump doubled tariffs on Turkish aluminium and steel last week after Turkey refused to release US citizen Andrew Brunson, a pastor who has been held in Turkey since 2016. The US has also sanctioned Turkish government officials in a bid to force the release of Brunson, who was arrested on charges of high espionage. The post Danish government freezes new guarantees to Turkey over lira crisis appeared first on Global Trade Review (GTR).